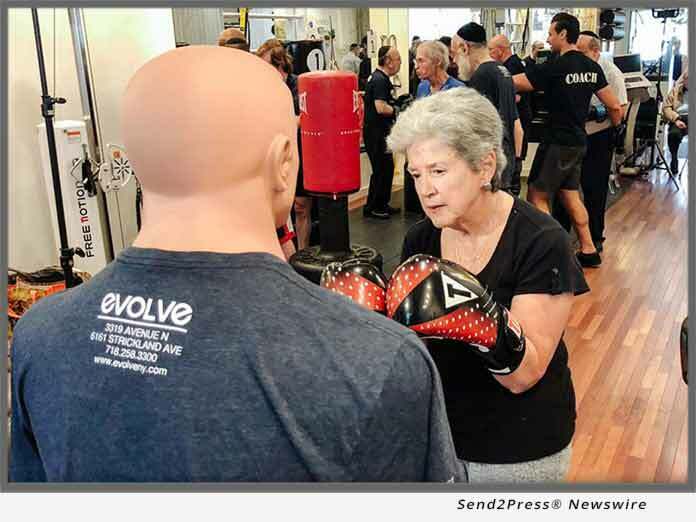 Evolve Physical Therapy proudly partners with Rock Steady Boxing to help knock out Parkinson’s disease throughout NYC, offers new exercise program specifically aimed at improving the quality of life for people living with Parkinson’s Disease, garners NBC Nightly News attention. (BROOKLYN, N.Y.) — NEWS: Evolve Physical Therapy proudly partners with Rock Steady Boxing to help knock out Parkinson’s disease throughout NYC, offers new exercise program specifically aimed at improving the quality of life for people living with Parkinson’s Disease, garners NBC Nightly News attention. Rock Steady Boxing (RSB) at Evolve NY offer a specialized exercise program that adapts pro boxing techniques for people with Parkinson’s disease, helping thousands of people across the country regain strength, mobility and hope. The Rock Steady Boxing training classes, taught by Evolve NY’s physical therapists and certified personal trainers, include an exercise program that attacks Parkinson’s at its vulnerable neurological points. NBC Nightly News cameras witnessed first-hand how Evolve Physical Therapy’s Rock Steady Boxing classes are operated, the positive impacts, and the palpable level of support and camaraderie generated each session. The NBC Nightly News special, which will air on Saturday, October 20, 2018 at 6:30-6:45 p.m. ET, documented how this amazing program taught by certified personal trainers and physical therapists, is changing the lives of many people living with Parkinson’s disease. The special will display how a wide variety of participants, both male and female and of all different age groups, gained confidence and mobility, as soon as they donned the boxing gloves to begin the overall fitness regimen. Neurology experts have found that boxing is exactly the type of forced, intense exercise that can help reduce, reverse, and delay the devastating effects of this disease. With this training program focusing on overall fitness, strength training, reaction time and balance, workouts can include focus mitts, heavy bags, speed bags, double-ended bags, jump rope, core work, calisthenics and circuit weight training. No boxing experience is necessary and people of all ages are invited to participate. The Rock Steady Boxing program provides the estimated 1-1.5 million Americans living with Parkinson’s disease an opportunity to substantially improve their condition and mobility, quality of life, a renewed feeling of hope, and a sense of community for people who’ve been so deeply affected by this disease. Location: 3319 Avenue N, Brooklyn, NY 11234. Class Times/Rate: Tuesday and Thursdays 10:30-12 p.m. or 3-4 p.m. and Sunday 1-2 p.m.
NYC’s Premier Holistic Physical Therapy Clinics by Evolve NY specializing in advanced physical therapy, orthopedics, sports medicine, strength and conditioning, injury prevention, rehabilitation, and personal training. Proudly serving residents all over NYC, Manhattan, Bronx, Queens, Staten Island, and Long Island. 3 Convenient Locations.